The EPROM simulator replaces up to 2 EPROMs on the target system. They can work in 8 or 16 bit mode. A 40 pin target adapter replaces 16 bit EPROMs. Banked EPROMs may be simulated too. 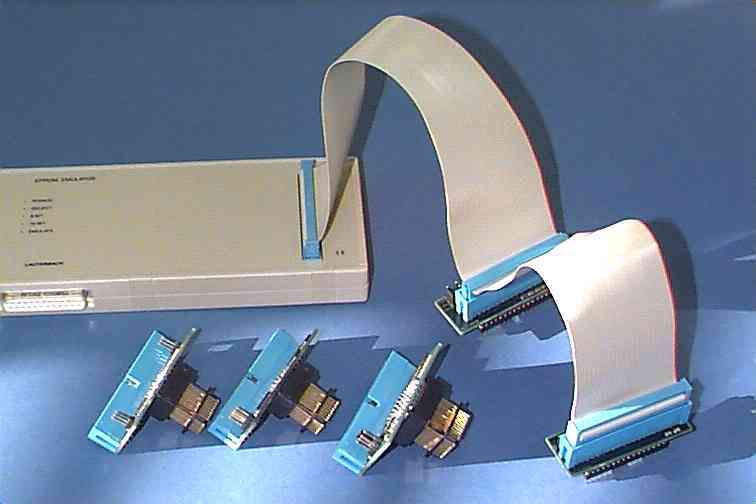 Two EPROM simulators are used to build a 32-bit emulation system. The EPROM simulator support communication functions. Therefore monitor programs can communicate very fast with the host system. The dowload speed is up to 100 KByte/sec. (400 KByte/sec. on ESI/64M). All TRACE32 monitor systems support this interface. For a detailed description of EPROM pinouts please refer to: EPROM/FLASH Simulator document.